The page below provides more detailed information about our Research Centre. The Research Centre is situated on the first floor at the Essex Record Office, Wharf Road, Chelmsford, CM2 6YT. It is open to both members of the Society and to the public from 1 pm to 4 pm on Wednesdays, from 10 am to 1 pm on Thursdays. There are two sessions of 1 hour 30 minutes each on Wednesdays and Thursdays. Seats can be reserved by telephoning 01245 264773 but they need to be booked during the times detailed above so you will need to plan your visit or take the chance that a place is available when you turn up. Only one session can be booked on any particular day but if you book the first session and there are places available at the end of that session then you can remain for the second session. Reserved places may be reallocated if they are not taken up within 30 minutes of the beginning of the session booked. Only three separate bookings for different days can be made at any one time. When calling, you will need to give your name, membership number and specify whether you want the first or second session, a computer or a fiche reader. Please note that anyone visiting the ESFH research room will need to hold a CARN card or take out a day pass from the ERO Reception Desk on the ground floor. Non members using our facilities will need to hold a CARN card, which is available from the ERO reception (proof of residence is needed for this). ESFH members will need to quote their membership number if wishing to benefit from the lower printing etc costs available to members. 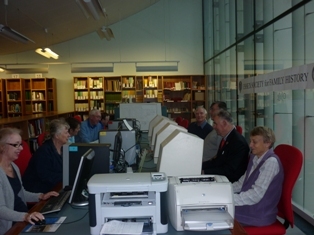 The Centre is equipped with several computers which give members free access to the Internet In addition we provide access to the Vital Records for Great Britain, Australia and North America, as well as the Essex Burial Index (compiled as part of the National Burial Index). We continue to add other genealogical aids and indexes . The computers have a menu from which you can select the records you want and gain access at the click of a button so if you do not consider yourself computer literate, do not despair a little help from our volunteers will soon put you on the right track. The sessions will take place in our Research Centre on a day and time to be arranged and will be free of charge. In addition there are also several fiche readers that can be booked. We still hold the microfiche indexes for the GRO birth, marriage, death and miscellaneous indexes from 1837 to 2001, and much more. The Research Centre also holds our library. Personal callers can obtain over the counter any of the CDs offered for sale by our CDs by Post Service.